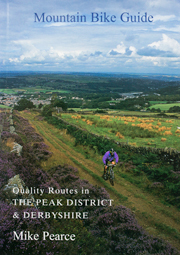 The Mountain Bike Guide - Quality Routes in The Peak District and Derbyshire - routes list. There are 24 circular routes in the book. All have been carefully researched to maximise the off road distance and to cover some of the most interesting rough stuff in the region. Routes off all grades of difficulty are described. The rides vary in length from 8 km (5 miles) to 50 km (31 miles); times taken from 1 to 6 hours for an 'average' party.